Ivette Ivens, a photographer and mother from Chicago, has released a book of images celebrating women who breastfeed their toddlers, to help normalise extended breastfeeding. 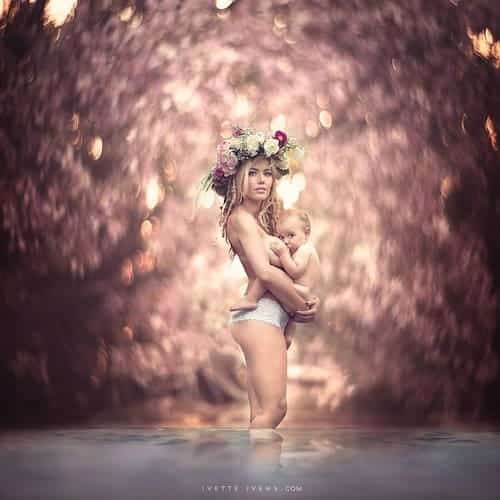 The portrait images, which depict mothers breastfeeding their toddlers in breathtaking natural settings, have been displayed at an exhibition entitled “I breastfeed my toddler”. Mother of two and advocate for extended breastfeeding, Ivette was keen for nursing mothers to feel completely at home during the show. A breastfeeding station was set up by the doorway, and she attended the event with her young children, one of whom she nursed during the exhibition. These moving images have touched many women, and gained the admiration and appreciation of many mothers for their portrayal of extended breastfeeding as normal. Some were even moved to tears. Extended breastfeeding is normal, yet many women face stigmas and challenges when they choose to breastfeed beyond the baby stage. Ivette’s images capture the power and strength of breastfeeding mothers, as well as showing that there is nothing unusual about breastfeeding past babyhood. People seem to have different ideas of what is ‘normal’ when it comes to breastfeeding. The term ‘extended breastfeeding’ seems to imply that breastfeeding a child past infancy is going the extra mile. Although it might not be practised by the majority of mothers, it’s normal, natural and beautiful. For those mothers who choose to practise extended breastfeeding, or to let their children self-wean, breastfeeding past infancy is the norm. Nature itself dictates that it’s the norm; many traditional communities around the world continue the practice. These images aim to show the rest of society that it is normal practice. They send a message to those who think women should cover up whilst breastfeeding, or breastfeed only at home, and stop breastfeeding before their babies grow teeth. These people might never sit down to read an article about why extended breastfeeding is normal, but a picture is worth a thousand words. So let’s hope that these images speak to them. They stand as proof that breastfeeding a toddler is not only normal but natural too. Ivette wants to capture the beauty and ease of extended breastfeeding. She aims to show just how natural it is to breastfeed a toddler. She encourages women to stop worrying, covering up or excusing themselves to the bathroom to feed. Instead she celebrates this animalistic and natural practice. The women were shot in whatever pose they felt most comfortable, and the result is a wide variety of images. Some mothers remain fully clothed, others are wearing nothing. The locations vary too, each adding something unique to the photographic series. The resulting images are simply beautiful. Proud, strong mamas breastfeed their adorable toddlers in awe-inspiring locations. From snow-covered fallen trees, to luscious greenery, the backgrounds of the portraits remind the viewer that this is all about nature. Breastfeeding Goddesses is available for pre-order now, and will be on sale in November 2015. You can pre-order the book here. Take a look at BellyBelly’s article Extended Breastfeeding: What You Need To Know to get the facts about breastfeeding past infancy. It’s natural and not offensive, and it should be included in children’s cartoons with baby characters. I nursed my three girls for 2 to 2 1/2 years my first born went to 3 years. Now they are 23, 18, and 6. Best thing I did. Doctors told me as long as it makes us happy then have at it. Never had a problem. I think it’s a beautiful healthy thing for mom and baby. Have at it breastfeeding moms who cares what anyone else thinks. You rock.